On June 2014, the Black Sea town of Varna, Bulgaria, was hit by heavy rains. Тhe suburb of Asparuhovo was swamped by a three-metre high wave destroying everything in its path, killing 13 people. According to the authorities, the disaster was due to an illegal waste site and unmaintained drains which allowed a large amount of water to collect and subsequently sweep away the illegally built houses. However, the residents believe that the huge wave was not caused by the torrential rain but by a breakage of the nearby military base’s reservoir. Rumors of divine retribution, UFO interference and even a HAARP (American military program) attack also spread. 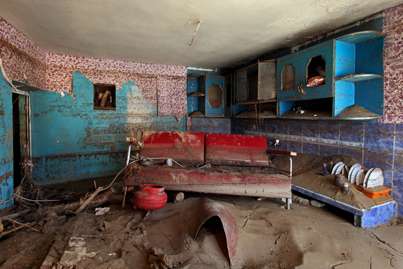 Right after the flood Nikola Mihov spent three days in Asparuhovo documenting the interiors of some of the worst hit houses in the Roma neighborhood, as well as the stories of their inhabitants.